Successfully Added Old-Fashioned Bluetooth Mini Phone to your Shopping Cart. 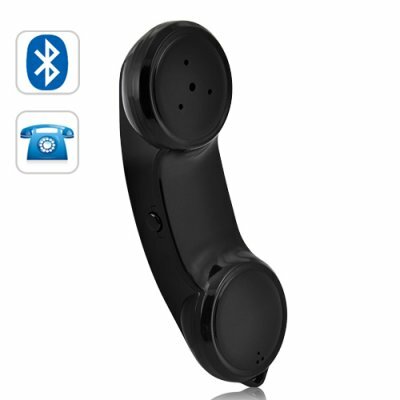 Meet the Retro Bluetooth Mini Phone, a portable and easy to operate Bluetooth earphone. Never miss calls again while keeping the look and feel of an old-fashioned phone. Is your Bluetooth earpiece uncomfortable and often slipping out of your ear? With the unique and portable design of this Bluetooth Mini Phone, you can carry it around your neck on a convenient lanyard or just keep it in your pocket and instantly answer calls! Whether you're at the office or working out, this Bluetooth Mini Phone delivers the comfort and reliability of an old-fashioned handset. When you receive a call, you just need to lightly press a single button to answer. The Bluetooth Mini Phone also includes volume keys to fit your needs. Along with support for Bluetooth 2.0, this accessory will work with most mobile phones. Small and lightweight, this inexpensive Bluetooth device is a must have for people on the go who need to always be ready to answer the power. Brought to you by Chinavasion, the leader in wholesale electronics and Bluetooth accessories. Note: This great new product is available with no MOQ (minimum order quantity) for a limited 60-day run. After that it, it will only be available for orders with a MOQ of 4 units..
Only need to pair your mini phone once, then it will automatically connect with your mobile phone. To switch it on, press and hold the call button for approximately 4 seconds. In the case of no obstructions the mini phone can be used up approximately 10 meters away from your mobile phone. What is the passcode for pairing the Bluetooth earpiece?